The Codex Alexandrinus is an early fifth-century manuscript of the Greek Bible, containing the majority of the Septuagint and the New Testament. It is one of the four Great uncial codices. Along with the Codex Sinaiticus and the Vaticanus, it is one of the earliest and most complete manuscripts of the Bible. It derives its name from Alexandria where it resided for a number of years before it was brought by the Orthodox Patriarch Cyril Loukaris from Alexandria to Constantinople. Then it was given to Charles I of England in the 17th century. 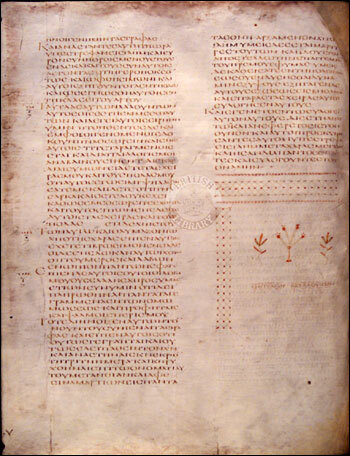 Until the later purchase of Codex Sinaiticus, it was the best manuscript of the Greek Bible deposited in Britain. Today, it rests along with Codex Sinaiticus in one of the showcases in the Ritblat Gallery of the British Library. A full photographic reproduction of the New Testament volume (Royal MS 1 D. viii) is available on the British Library's website. The manuscript's original provenance is unknown. Traditionally Alexandria is considered the place of its origin and it is the most probable hypothesis. Cyril Loukaris was the first who pointed to Alexandria as the place of origin of the codex. This popular view is based on an Arabic note from the 13th or 14th century, on folio 1, which reads: "Bound to the Patriarchal Cell in the Fortress of Alexandria. Whoever removes it thence shall be excommunicated and cut off. Written by Athanasios the humble." "Athanasios" is identified with Athanasios III, Patriarch of Alexandria from 1276 to 1316. F. C. Burkitt questioned this popular view. According to Burkitt, the note reads: "Bound to the Patriarchal Cell in the Fortress of Alexandria. He that lets it go out shall be cursed and ruined. The humble Athanasios wrote (this)." The manuscript had been found on Mount Athos, according to Cyril Loukaris' deacon, and the manuscript might have been taken to Egypt by Cyril in 1616, and that all the Arabic writing in the manuscript could have been inserted between that date and 1621, when Cyril was elected Ecumenical Patriarch of Constantinople. On this supposition "Athanasios" might have been "some person of Cyril's staff who had charge of his library." According to Burkitt's view the codex was found on Athos, but it was written in Constantinople, because it represents a Constantinopolitan text (now known as the Byzantine text). This hypothesis was supported by Kirsopp Lake, though challenged as well. Perhaps Cyril's deacon lied in order to cover up the fact that Cyril took the manuscript despite the curse written on it against the one who would dare remove it from Alexandria. According to an Arabic note on the reverse of the first volume of the manuscript, the manuscript was written by the hand of Thekla, who was thought to be a fourth century Greek virgin who founded a monastery in Egypt and had corresponded with Gregory of Nazianzus and died soon after the Synod of Nicaea in 325 (though she would have died later if she had corresponded with Gregory). Tregelles made another suggestion, the New Testament volume has long been mutilated, and begins now in the twenty-fifth chapter of Matthew, in which chapter the lesson for the Protomartyr Thekla's feast day stands. "We cannot be sure how the story arose. It may be that the manuscript was written in a monastery dedicated to Thekla." Tregelles thought that Thekla's name might have on this account been written in the margin above, which has been cut off, and that therefore the Egyptians imagined that Thekla had written it. Cyril Loukaris believed in Thekla's authorship, but the codex cannot be older than from the late fourth century. Codex Alexandrinus contains the Epistle of Athanasius on the Psalms to Marcellinus, therefore it cannot be considered earlier than A.D. 373, and it is the terminus post quem. Furthermore, the only Thekla that Gregory corresponded with lived in Caesarea in Asia Minor, though the manuscript seems to be clearly of Egyptian origin.The authorship therefore is unknown. 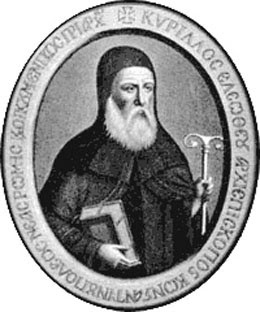 The codex was brought to Constantinople in 1621 by Cyril Loukaris when he left his patriarchal see in Alexandria and became Ecumenical Patriarch of Constantinople. Loukaris was involved in a complex struggle with the Turkish government, the Latin Church, and his own subordinates. He was supported by the English government and presented the codex to James I in 1624 (this James issued the King James Bible in 1611), as a gratitude for his help. The codex was presented through the hands of Sir Thomas Roe (together with minuscule 49), the English ambassador at the court of the Sultan. Roe had helped Loukaris many times in his struggles against the Turks and Latin propagandists, and even helped him bring the first printing press to Constantinople, even though it was opposed by Ottoman authorities. This played no small role in Loukaris showing his gratitude by giving over the manuscript as a gift. It should be noted also that Roe strongly persuaded Loukaris to hand over his valuable books to be published for the benefit of all of Christendom, though we only know of the Codex Alexandrinus. King James died before the manuscript started for England, and the offer was transferred to Charles I in 1627. It became a part of the Royal Library, British Museum and since 1973 of the British Library. It was saved from the fire at Ashburnam House (the Cotton library) on 23 October 1731, by the librarian, Richard Bentley.